I pulled a big box of cutlery out of a trash bag somewhere in the lower Plateau. I don’t really need cutlery (see previous post), so I just left it next to a couple of park benches nearby. 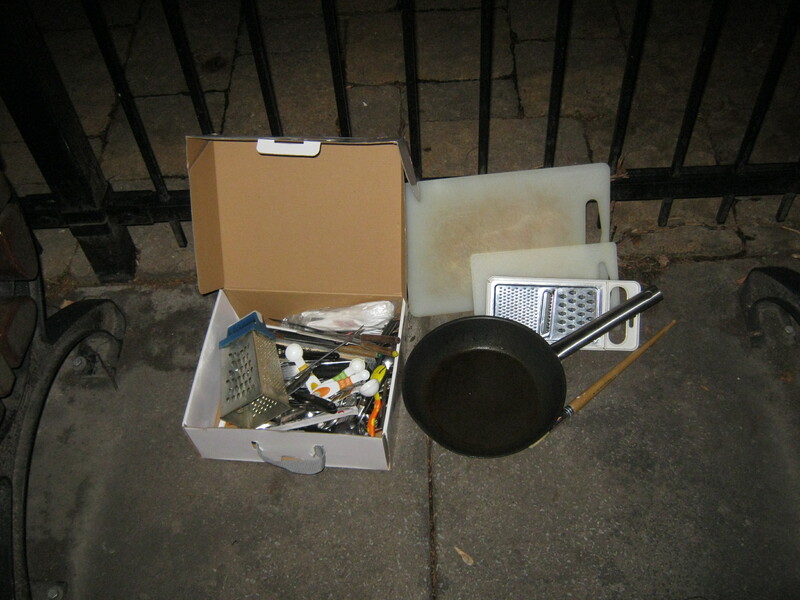 There was also a couple of cutting boards, a decent looking teflon frying pan, and a paintbrush. 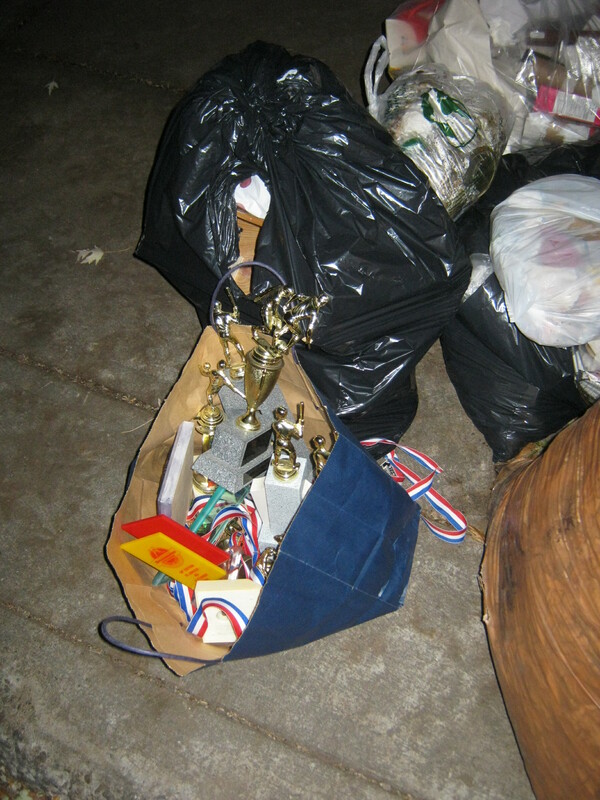 I guess someone did some cleaning and decided to get rid of their old collection of trophies. They seems to be from the late 80s to early 90s, covering a range of sports including hockey and soccer. A pile of trash eh? Let’s take a look. Looks like I found an old computer setup. The main piece is the Commodore VIC 20, a machine that was made in the early 80s and predates the more famous Commodore 64. I imagine the VIC 20 to be the androgynous, kinder hearted sibling of Hal 9000, but I might be weird. 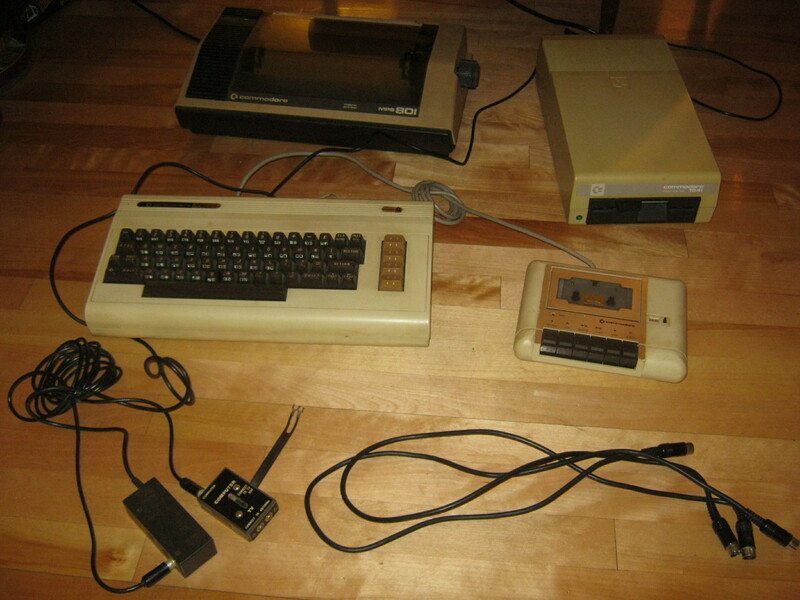 There’s also a disk drive (1541), a printer (MP 801), and a tape drive (datassette), all of which bear the Commodore name. Back in the day you’d hook this all up to the TV and play really old games or write books or do whatever it is that people did on computer back in the early 80s. The only part missing is the power cable for the VIC 20, which is unfortunately because it’s the part that makes the whole deal basically untestable. A couple of pieces you could turn on independently though. I turned on the printer and it made those nice dot matrix sounds and moved around a bit. The disk drive turned on and made an effort to read what wasn’t there. That’s a good sign for those pieces and the likelihood that the other pieces work too. There’s some collectors value to the VIC 20, though less so without being able to test it. I may try to buy that wire, see if it works, and then sell it or barter it or whatever. I’ll keep you posted! I really feel sad when someone throws out old sports trophies or family photo albums of their own in the garbage.Sometimes these things are thrown out by mistake.I hope strangers return these personal items to the family or give thrown-out photos to an organization that digitizes old photos and preserves the history as well as the originals.Please keep doing this even after your studies are over on a part-time basis.You need other partners to join your mission and share their findings with you.You cannot cover most of the city by yourself. Ah, the Commodore computer range. I think many yrs ago a boyfriend of mine must have found this very same one from the garbage tip. 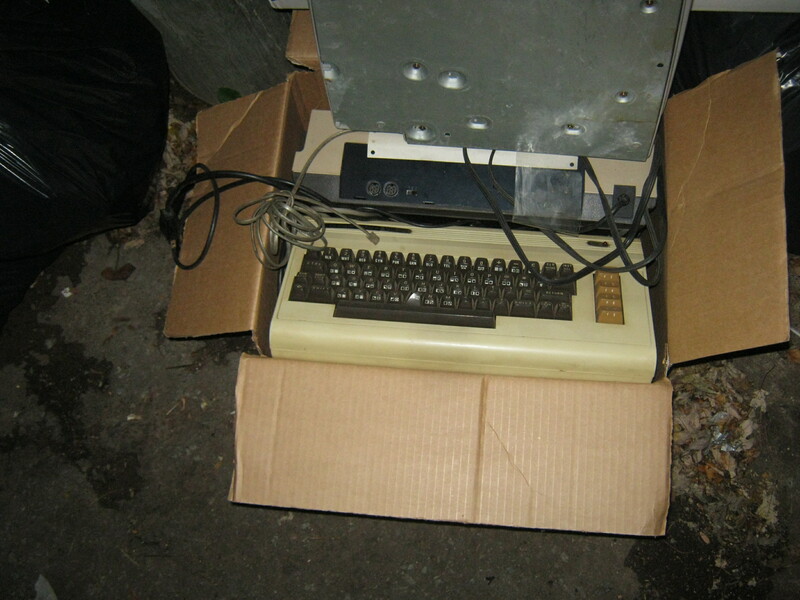 It motivated us to buy a brand new commodore 64. It was definately different from the 64 much more chunkier. I always recall his mum asking what we would do with a computer and my lame answer was play games (and type tacked on the end to make it sound really useful). It seemed so exciting to own a ‘computer’ but now seems so silly to buy that archaic contraption basically just to ‘play games’! I guess I wanted to be tech head way back then. Lol it would be nice to see it go to some one who will value its history. I must say, your evenings out are interesting and varied. 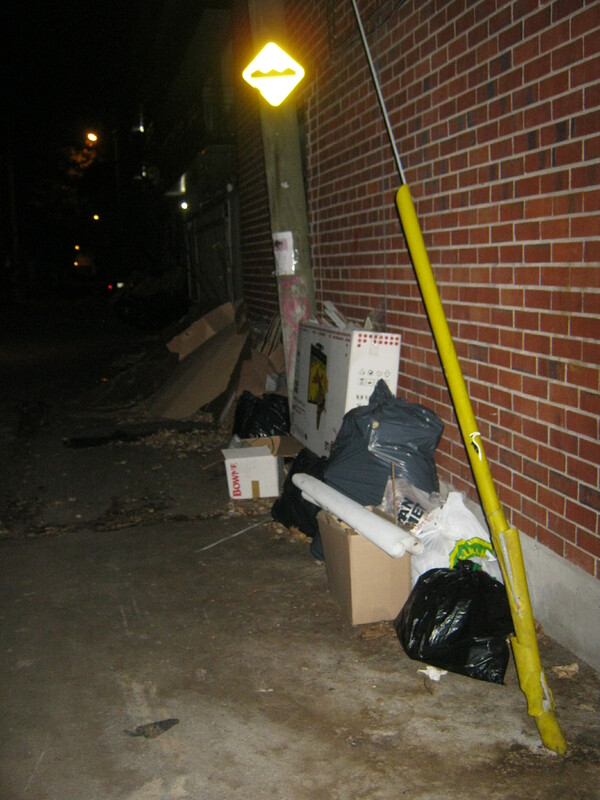 I live in lower Westmount.The recycling pickup day in Westmount is Wednesday morning.My friend lives in Ville Emard,the district between Jolicoeur and Angrignon metro and I visit the area at times.I know that in Ville Emard and Cote St.Paul,both the garbage pickup and recycling are done on Friday morning.So if you could do some field research for example in these two localities in the night or early morning,please share your discoveries on the blog.I keep my eyes open on garbage pickup day and scoop out some good items from the trash some weeks,but I do not check most streets.I only take what good stuff in the trash I come upon haphazardly.I want to see how the garbage output varies from the Plateau to Westmount to Emard. I have been interested in making it to “far away” garbage days. It’d be a nice change of pace and I’m sure that’d I’d end up finding a different type of stuff, symbolizing a different sort of history. I’m going to try to get up early and check it out this Friday. I’ll make a post about it if I do! Hey,this is the most original and interesting blog I have found about Montreal.Instead of talking and ranting about plain politics and bickering,you are focusing on good stuff and historical items that Montrealers throw out..I found 30 -year old Rolling Stone magazines in a recycling bin in spring 2012 in a working class neighborhood and took them.I have kept the vintage magazines on my bedstand.I hope they will stay with me for good.Just want to encourage you in your attempt to retrieve and collect historical items from trash and reuse other good trashed stuff.Please do take advantage of the relatively mild weather for the next few weeks to dumpster dive and profile garbage.From mid-December to end of February,it will be difficult for you to dumpster dive amid the piles of snow,fierce winds and freezing temperatures.BONNE CHANCE.BRAVO. Thanks, and good find for you too. I’m thinking of diversifying a bit in the next month (before it gets really cold as you say) and try to check out some other neighborhoods. I think it’d be interesting to if the type of stuff I find changes much.